SuNMaP 2 is a five-year programme designed to reduce the burden of malaria in Nigeria. It is funded by the UK Government through UK aid. 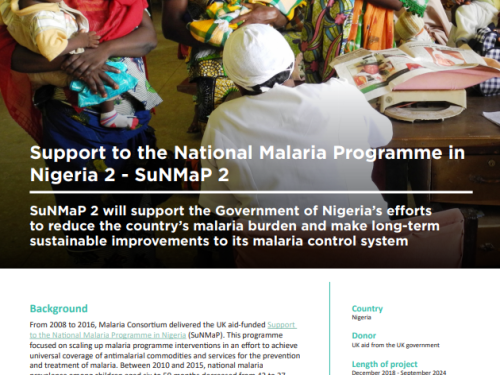 From 2008 to 2016, Malaria Consortium delivered the UK aid-funded Support to the National Malaria Programme in Nigeria (SuNMaP). This programme focused on scaling up malaria programme interventions in an effort to achieve universal coverage of antimalarial commodities and services for the prevention and treatment of malaria. Between 2010 and 2015, national malaria prevalence among children aged six to 59 months decreased from 42 to 27 percent, reaching an average of 21 percent in SuNMaP supported states. Despite this progress, in 2017 Nigeria still accounted for 25 percent of malaria cases globally, making it one of the highest burden countries in the world. Such a figure highlights the need for a further, comprehensive malaria programme. It is essential that there is government involvement and stewardship of SuNMaP 2, including through the allocation and release of funds, to ensure that the interventions are sustainable. Malaria Consortium and its partners will, therefore, work in collaboration with government structures at the national and sub-national levels to coordinate and harmonise the planning, implementation and evaluation of programme interventions. This programme has also been designed to ensure collaboration with other relevant UK aid-funded programmes that are addressing issues around governance, accountability and health systems strengthening, to facilitate long-term institutional and transformational change. SuNMaP 2 is a performance-based programme, with robust monitoring, evaluation, accountability and learning components.